One essential thing to remember when optimizing SEO is to create quality content. Relevant, valuable content helps to build trust with your readers, educate and inform them and will open the doors to communication. Content can come in many different forms: web pages, a blog, calls to action, links etc. Do consider your target audience and traffic sources. A blog is like a garden; you need to tend to it every now and again. Be consistent with your posts. Make sure your blog uses a long-tail keyword (see #3) in both the title and in the body. Remember, blogs are a great way to present content in a way that is both creative and extremely flexible. Try writing a “How-To Guide” or a “20 Reasons to ____.” Supply your reader with up to date real estate news or a video. Get visual. Always add at least one relevant photo to your post to keep readers engaged. Create a separate web page for each keyword phrase or topic. This will create more relevant content for search engines to find. Every website page and article should have at least one call to action before the page’s fold. This should create an internal link on your website to a specific landing page. If you use an image (which you should!) optimize the image file name with a long-tail keyword. If you mention a keyword on other pages, link to your first page using the long-tail keyword. For example, if on other blog I spoke about “Real Estate SEO” I would then use that phrase as an anchor text. If your entire web presence consists only of your main webpage, you may as well be invisible to the rest of us. Spread your technological wings and get on out there. “Social Search” is the intersection of SEO and social media. Content that has a social connection to the user can actually be prioritized; content that is both relevant and trusted will be ranked first. What’s not to “like”? For realtors it is important to make an account on Facebook, Twitter, and LinkedIn and actually use them. Accounts that are active show up on followers’ newsfeeds—just make sure not to overdo it! Keep in mind that each social channel has its own rules of frequency. Share your business information on these pages. This will drive potential customers to your main webpage. To make sure your webpage is showing up when home buyers search, real estate Search Engine Optimization of keywords is essential. Search engines crawl over pages looking for relevant keywords, helping qualified prospects to discover your site. The keyword should be included in: your page title, a headline on the page, within the URL, as an image file name, and at least once within the content. 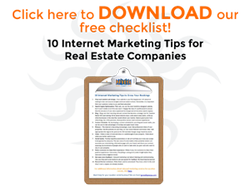 Spending on traditional marketing sources to have a successful real estate business is no longer practical. You may want to partner with an inbound marketing agency to make sure that you are growing your business and aren’t left behind. This entry was posted in Real Estate Marketing, SEO & Internet Marketing and tagged Real Estate SEO, SEO, SMO & Web Design. Bookmark the permalink.